First a little techie lesson: hotlinking is the process of displaying an image or other media from another website directly on your website without actually copying it to your server first. Essentially, this means the image or video is being hosted by one site and displayed by another. Some websites like this and encourage you to do it, think Flickr, SmugMug and YouTube, but most general purpose websites like this one, don't because it's effectively stealing bandwidth which I'm paying for. I'm very good in making sure I don't hotlink unless I'm encouraged to; whilst I may not own the image, I do have the decency to make sure I only use my own bandwidth to show it off. 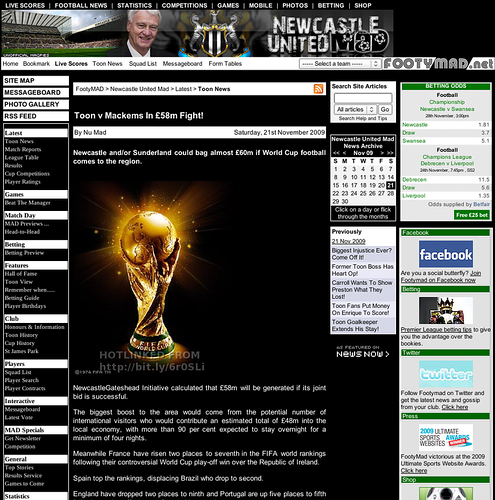 Unlike several sites that have discovered the World Cup pic I used here (I can't remember where I originally found it), one of which is Newcastle United Mad. 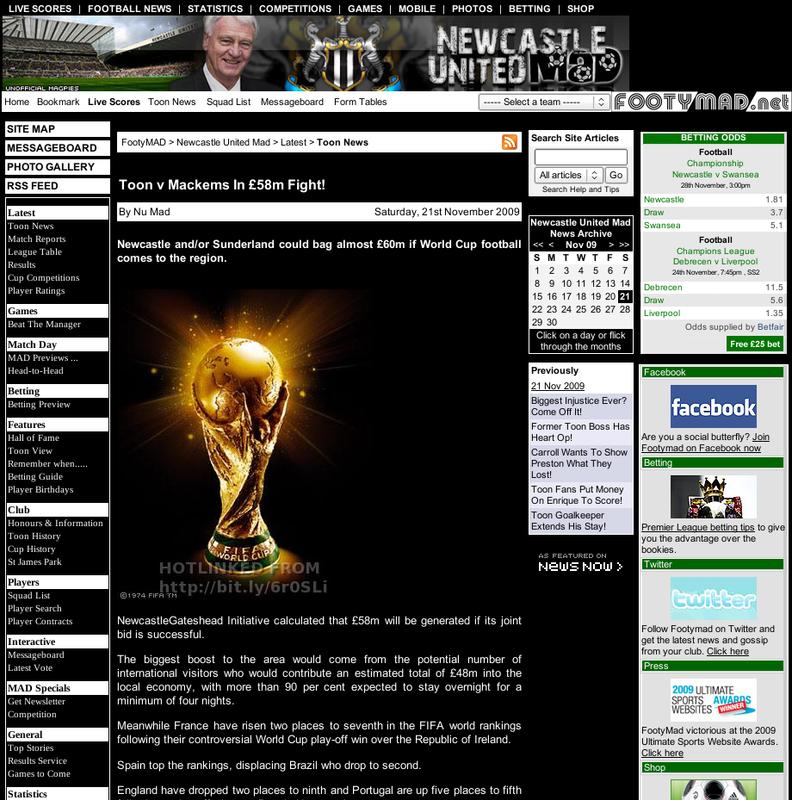 Now I know why these sites use this picture - it's a great picture and it ranks well when searching for "world cup" on Google Images so is easily found. But sadly, they don't consider the consequences of hotlinking directly from my website. That way, they get the image and I get a link back (it's only useful if people manually enter the URL, hence I've used a nice short one). If the website owner hotlinking to the image doesn't like the watermark, they can change it and use a local copy of the image (which I'm hoping they will do).